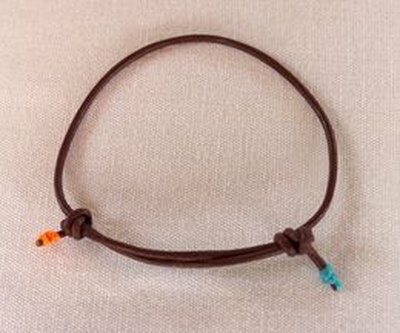 The classic leather slip-knot bracelet is an accessory that you can make in less than five minutes, yet enjoy all summer long. 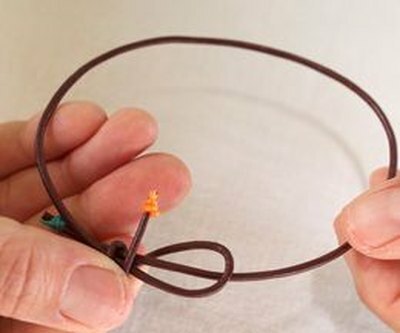 Once you get the hang of it, the possibilities are unlimited for creating your own unique jewelry. 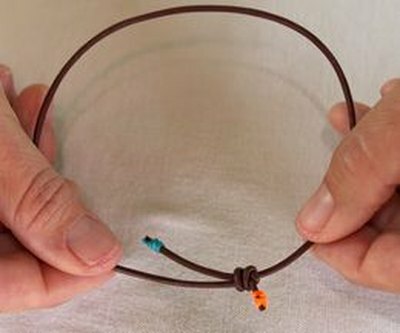 To make a leather cord slip knot bracelet, all you'll need is some leather cord and scissors. Please see the last slide for an itemized list of tools and materials. Curve the orange end of the cord about two inches deep into a "U" shape that will lay on top of the blue end. The tips should be facing in the same direction. Loop the orange tip under the blue end to begin wrapping the two sides together. 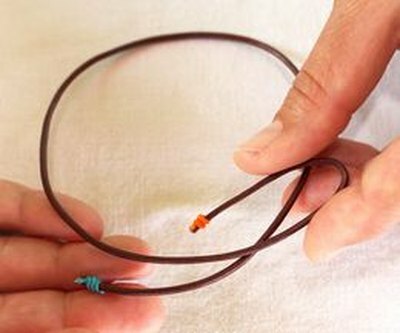 Wrap the orange tip around to complete one full loop. Loop the orange tip under the blue end to start wrapping the two sides together. Keep turning the end in the same direction, for a total of 1 1/2 turns. When the orange end has wrapped two full times around, the tip should be positioned under the original "U" loop opening from the very first step of the wrap. From the bottom, push the tip up through the loop at the end. 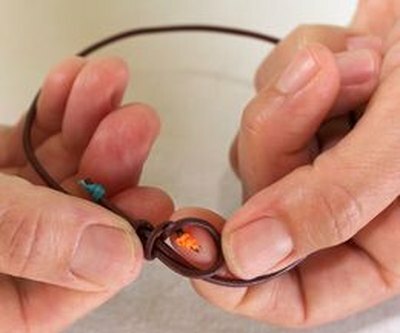 Pull the orange tip and the cord on the other side simultaneously until knot is tight. Don't pull the blue tip -- this end will hang loose. 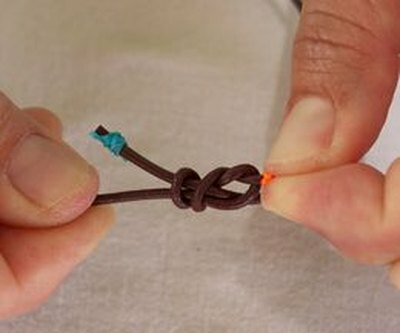 Your first knot is now complete. 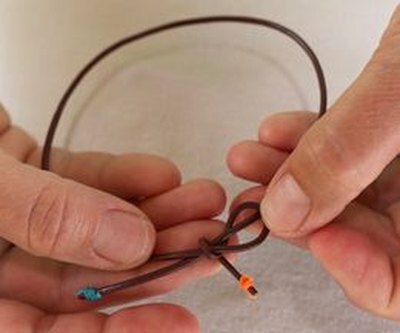 Pull the blue tip cord until you have enough length to repeat the process on the other side, but this time you will start the knot by making the blue side into a U shape. 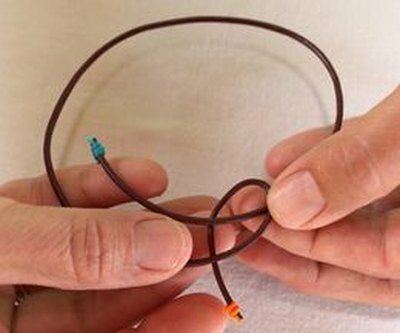 After you finish both knots, double check to make sure they are nicely tight. Then proceed to cut off the ends. Slide the knots along the cording to adjust the size. 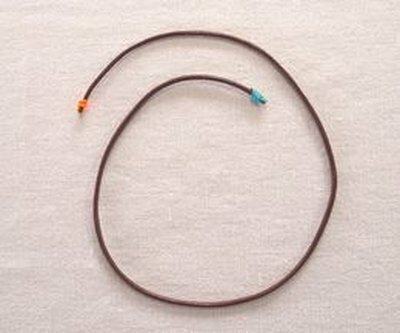 Leather cording is available in many different colors and sizes. 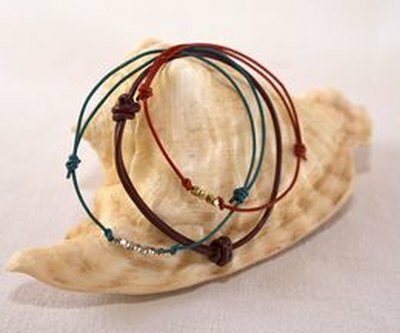 By adding beads or charms to the cord before you knot it, you can create an endless variety of designs and styles. 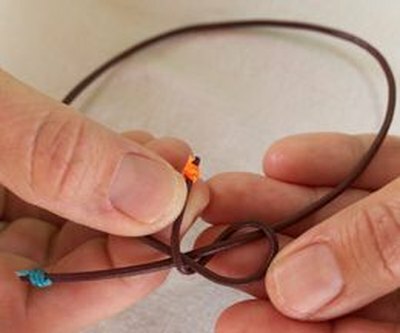 Apply the slip knot to a longer cord to make a necklace.